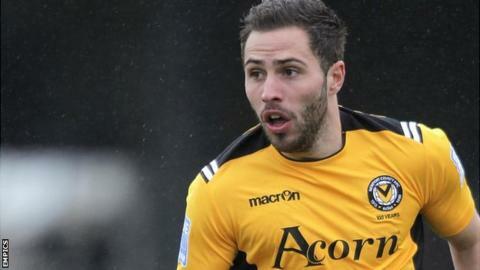 Robbie Willmott's sweet first-half free-kick was enough to defeat Braintree Town and take Newport County into the second round of the FA Cup. Willmott's 20-yard shot found the top corner just before the break after Ryan Peters conceded a needless free-kick. League Two promotion-hopefuls Newport had more possession throughout. But the best chance of a tight first-round replay fell to the non-league side when Matt Paine wasted a free six-yard header with the score goalless. Newport keeper Lenny Pidgeley was also forced into a fine diving save from away substitute Liam Enver-Marum after the interval. But the Welsh side rarely looked like surrendering their lead and posed the greater threat in the second period. Adam Chapman nearly made it 2-0 with a superb strike that forced a fantastic save from Nick Hamann. However, Newport did not need a second goal, despite a spirited Braintree finale, and the hosts go through to face Kidderminster Harriers at Aggborough in the second round. "We knew it was going to be tough. Braintree are having a good season, didn't have anything to lose really and came here and gave a good show. "It was about attitude tonight. To be fair to the boys they had a go. The pitch was a bit bobbly and we did try and pass it at times. "We weren't as good as we were [against] Hartlepool but you're not going to be great every week." Match ends, Newport County 1, Braintree Town 0. Second Half ends, Newport County 1, Braintree Town 0. Corner, Braintree Town. Conceded by Adedeji Oshilaja. Danny Crow (Newport County) is shown the yellow card. Foul by Danny Crow (Newport County). Matthew Paine (Braintree Town) wins a free kick in the attacking half. Hand ball by Dean Wells (Braintree Town). Substitution, Braintree Town. Jordan Cox replaces James Mulley. Corner, Newport County. Conceded by Nick Hamann. Attempt saved. Conor Washington (Newport County) right footed shot from the centre of the box is saved in the centre of the goal. Attempt saved. Michael Flynn (Newport County) right footed shot from outside the box is saved in the top centre of the goal. Substitution, Newport County. Michael Flynn replaces Tom Naylor. Foul by Conor Washington (Newport County). Matthew Paine (Braintree Town) wins a free kick in the defensive half. Substitution, Braintree Town. Bradley Quinton replaces Dan Holman. Attempt saved. Ryan Jackson (Newport County) right footed shot from outside the box is saved in the centre of the goal. Lee Minshull (Newport County) wins a free kick in the defensive half. Foul by Samuel Habergham (Braintree Town). Foul by Ismail Yakubu (Newport County). Sean Marks (Braintree Town) wins a free kick in the defensive half. Dean Wells (Braintree Town) wins a free kick in the defensive half. Substitution, Newport County. Lee Minshull replaces Christian Jolley. Attempt saved. Danny Crow (Newport County) header from the centre of the box is saved in the centre of the goal. Substitution, Braintree Town. Liam Enver-Marum replaces Luke Daley. Attempt missed. Dan Holman (Braintree Town) right footed shot from the right side of the six yard box is too high. Conor Washington (Newport County) wins a free kick in the defensive half. Foul by Dean Wells (Braintree Town). Harry Worley (Newport County) wins a free kick in the attacking half. Tom Naylor (Newport County) wins a free kick in the attacking half. James Mulley (Braintree Town) wins a free kick in the attacking half. Attempt missed. Ismail Yakubu (Newport County) header from the centre of the box misses to the right. Corner, Newport County. Conceded by Samuel Habergham.